Sukuk issuance in 2014 is estimated at $130 billion, with outstanding issuance continuing to grow. The sukuk market remains largely sovereign and quasi-sovereign issuers, but private-sector issuance is on the rise. There is a growing appeal of sukuk financing, with an increasing awareness among conventional investors of Islamic financing and rising appetite in non-Muslim countries, particularly for access to long-term financing. 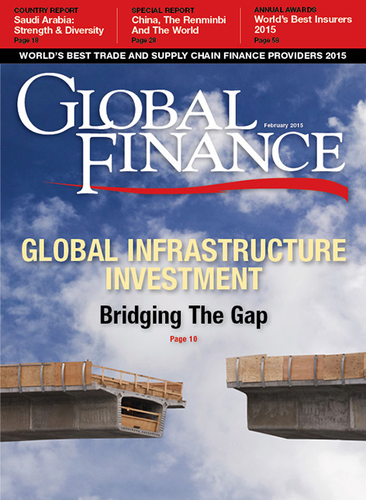 Sukuk financing is increasingly cross-border, as foreign issuers tap local and regional funds. This move is facilitating more intraregional flows, both in Gulf countries and in Asia, according to Siew Suet Ming, head of structured finance at Rating Agency Malaysia. The move can help to lower the cost of funding. Innovation is also driving issuance. Diversification in sukuk offerings is growing, providing new structures and benefits to investors and issuers—meeting market demand and specific financing needs. Sophisticated sukuk deals, including the use of hybrid structures—which often involve the use of more than one Islamic contract—and the emergence of new alternative asset classes, point to the growing comfort of global investors in sukuk instruments. The implementation of Basel III has led to Islamic firms’ issuing Basel III‒compliant sukuk instruments to satisfy revised capital standards, according to Kuwait Finance House. Islamic banks in the UAE, Saudi Arabia, Turkey and Malaysia have issued such innovative sukuk instruments. Abu Dhabi Islamic Bank was the first to launch this type of issue in late 2012, and others have followed, including Dubai Islamic Bank’s perpetual $1 billion Tier 1 sukuk in March 2013. Perpetual tenor debt has no maturity date, but generally is callable (can be repaid) on a specified date. The DIB deal had a profit rate of 6.25% and was 14 times oversubscribed. In early 2014, Malaysia’s AmIslamic Bank was the first to use the shariah-compliant contract of murabaha (debt-backed) for structuring this type of sukuk. The bank’s 200 million Malaysian ringgit ($56 million) Basel III-compliant Tier 2 subordinated sukuk murabahah is callable after five years, has a semiannual profit rate of 5.07%, and was issued under its 3 billion Malaysian ringgit subordinated sukuk murabahah program. Malaysia Building Society issued the world’s first 3 billion ringgit ($844 million) structured covered sukuk commodity murabaha program with dual recourse structure and backed by financing receivables. Perpetual sukuk, pioneered by Abu Dhabi Islamic Bank, are increasingly being issued by corporates. Saudi premium food group Almarai issued the first-ever Saudi riyal‒based perpetual sukuk in late 2013. Corporates in Malaysia and the Middle East are increasingly using intangible assets in innovative sukuk structures. This includes airtime vouchers, broadband units and intellectual property. Banks in the Middle East are seeing increased interest from non-Islamic corporates for sukuk issuance, and it is an area that they want to grow. Last year saw a number of other firsts for the sukuk industry. The UK government, aiming to become a Western center for Islamic finance, became the first country outside the Islamic world to issue a sovereign sukuk. The £200 million ($302 million) issue was well-received by investors from the Middle East, Asia and the UK. The sukuk used the al-Ijara (asset-backed) structure—with rental payments on property providing the income for investors. Hong Kong also tapped the sukuk market in 2014—selling $1 billion of sovereign sukuk in its first-ever issue of the securities. Other Asian countries that issued sovereign sukuk in 2014 included Malaysia, Indonesia and Pakistan. The Indonesian transaction represented an important innovation in the way that sovereigns can issue sukuk to fund public infrastructure development projects, notes UAE-based partner of White & Case, Shibeer Ahmed. In late 2014, South Africa launched its first sovereign sukuk, a $500 million issue. Part of its aim is to diversify its funding sources and tap into the wealth of the GCC. Morocco, Tunisia and Kenya are likely to issue sukuk going forward. Gambia has already issued a short term, local currency sukuk, as have Nigeria and Sudan, and Senegal raised more than $200 million in its first local currency Islamic bond in early 2014. In late 2014, Luxembourg issued a €200 million ($254 million) sukuk. There remains a strong pipeline of sukuk issuance, particularly on the sovereign side. Demand should remain solid in 2015, although the current weak oil price may delay issuance. Both the UK and Hong Kong sovereign issues have been important, according to many Gulf-based banks, as they have broadened the profile and recognition of sukuk.